Viewing visits are welcome. Just ring us to arrange a time. Settle your own cats into their apartment so that you know they are safe, relaxed and cosy. Bales Ash Cattery is set within 13 acres of beautiful North Devon countryside within easy reach of South Molton, Winkleigh, Torrington, Barnstaple, Bideford,and Crediton. We live in the house and cottage on site and have all owned and looked after cats for many years so you can leave your pets knowing that they will be cared for by animal lovers whose first priority is the welfare of your pets. 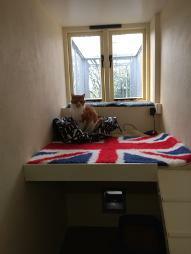 We want your cat to enjoy staying with us - they all have plenty of conversations and cuddles. 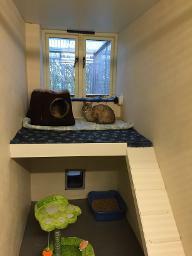 Each cat has their own spacious inside apartment with stairs up to a separate sleeping area and cat flaps leading to their own outdoor courtyard. All the courtyards look out onto the hedge to one of our fields offering plenty of bird life to occupy your cat as well as easy access to sunshine if they fancy a nap in the sun. We take pride in maintaining spotlessly clean pens and offering quality food from ethical companies. Since we took over in September 2014 we have invested in all new top quality vet bedding together with new beds and blankets for all pens. .
All diets and special requirements can be catered for, including administering any medication your pet may need during their stay. 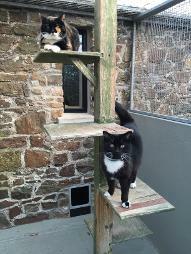 The cattery is well established and regularly inspected and licensed by Torridge council.